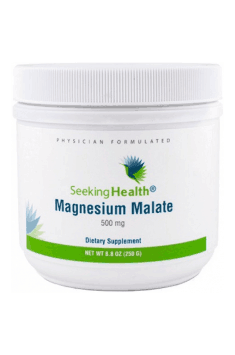 Seeking Health Magnesium Malate is a dietary supplement containing high-quality magnesium in the form of highly-bioavailable magnesium malate Albion®. The preparation is in the form of powder, and 1 scoop of the preparation contains as much as 500 mg of magnesium. Magnesium malate is a combination of magnesium with malic acid and constitutes one of the best assimilable forms of the mineral. The preparation has a beneficial effect on motor and intellectual function, eliminates the feeling of fatigue, supports mineral management in bones, carbohydrate management, and strengthens the cardiovascular system. Why is magnesium malate worth choosing? It has been observed that the combination of malic acid and magnesium can have a particularly beneficial effect on the activity of muscle cells. Malic acid is a naturally occurring substance that supports energy production, both during aerobic and anaerobic effort, so magnesium malate supplementation can prove extremely helpful in supporting energy metabolism, for example in times of intensive physical or intellectual strain. Magnesium is the second intracellular cation in terms of the amount found in the human organism. Magnesium participates in the activation of over 300 enzymes involved above all in energy metabolism. The element is also a very structural component of bones – it affects their normal mineralisation and helps to maintain their normal density and growth. Because magnesium ions work similarly to calcium antagonists, that is they reduce excessive tension and reactivity of blood vessels and are responsible for inhibit calcium inflow to cells, they are believed to play an important role in maintaining the right arterial pressure. Magnesium deficiencies can, therefore, not only increase the risk of developing arterial hypertension, but they can also contribute to atherosclerosis, heart failure, or stroke. Magnesium plays an important role in maintaining normal nervous system function. Magnesium has an anxiolytic and antidepressant effect, and helps to improve memory, concentration, and decision making, as well as stabilises the mood. The connection between magnesium deficiency and the pathogenesis of affective disorders and depression has been drawing more and more attention among researchers. It has been demonstrated that reduced magnesium levels in people with fully symptomatic depression increased and went back to normal as the disease regressed. Additionally, magnesium can boost the antidepressant effect of some drugs. Magnesium participates in the process of insulin release and its delivery to target locations. Magnesium deficiency has a negative effect on the process of enzymatic reactions involved in glucose metabolism as well as distorts the activity of insulin receptors, so low levels of the element in the organism can contribute to the development of insulin resistance and be one of the reasons of increased type 2 diabetes incidence; they can also increase the risk of chronic complications of diabetes. Magnesium deficiencies are caused above all by eating habits (large amounts of fats and dietary fibre in the diet, consuming too much tea and coffee, excessive alcohol consumption), as well as long-lasting slimming diets, and taking large doses of preparations containing phosphate ions, calcium, iron, copper, or manganese. Deficiency of the element can also occur in women using oral contraceptives and in patients who take, among other substances, antibiotics, cytostatics, tranquilisers, sedatives, or psychotropic drugs. The amount of magnesium in the organism also decreases with age, especially after 60 years of age. Increased demand for magnesium is caused mainly by: an intensive lifestyle, stress, physical and intellectual strain, as well as during pregnancy, lactation, and fast growth. The symptoms that can mean a great probability of magnesium deficiency are not specific and can be connected with many systems. Too low magnesium levels in the organism have a negative effect on the functioning of the central nervous system and contribute to the deterioration of the health of the nervous system (depression, twitching, hyperactivity, weakness, worse memory and concentration). At the same time, it contributes to disorders of the neuromuscular system (muscle cramps, numb limbs, worse exercise capacity) and the cardiovascular system (hypertension, distorted heart function). Magnesium deficiency can also be accompanied by such symptoms as: gastrointestinal tract peristalsis disorders, reduced insulin sensitivity, asthma-like breathlessness. To sum up, Seeking Health Magnesium Malate is a dietary supplement that helps to normalise magnesium levels in the organism. The preparation is recommended above all in times of mental and physical fatigue, or frequent or long-lasting exposure to stress. Blend, shake or briskly mix 1 scoop daily in filtered water or beverage of choice, or use as directed by your healthcare professional. Magnesium absorption can be improved by, for example, combining it with vitamin D3 or vitamin B6. Vitamin B6 (pyridoxine) can increase magnesium absorption even by 20-40%. The vitamin improves magnesium transport inside cells and helps to store it. Good sources of vitamin B6 are leafy vegetables, avocado, or nuts; however the vitamin is also available in the form of a dietary supplement. It is good to consider magnesium supplementation along with vitamin B6 and vitamin D3, especially in the form of a preparation, as in that case, you can be sure what dose you have taken. Goat colostrum in capsules. The product supports the proper functioning of the immune system. Methylcobalamin is an active coenzyme form of vitamin B-12 and is essential for cell growth and replication. Coriander in capsules. A popular herb that supports the digestive system and fights free radicals.